When looking for toddler girl bedding, the main idea is to set the mood for the room. It goes beyond the theme to the energy the colors and patterns create. Go beyond the traditional pastels and make the room a creative place to grow. 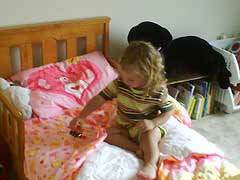 A polka dot comforter inspires playfulness. A toile pattern in blue is for your genteel little lady. Is a magical pink castle fitting for your little princess? Or, maybe you want to create a fairy forest wonderland. The only limit is your imagination. If your child has a favorite character from a book, consider using the colors and character bedding to enhance her imagination. If she loves Peter Rabbit, you could find a bunny-themed bedding or a solid grassy-green comforter and several stuffed bunnies to hop it up. Find a bunny book and decoupage pictures from the book onto a step stool or toy box to add to the theme. Does your daughter prefer a friend from one of her favorite television shows? Elmo, Dora the Explorer, Angelina Ballerina, Barbie or Madeline, a vast array of licensed toddler bedding sets is available. Many of the Disney princesses have their own bedding as well from the Little Mermaid to Alice in Wonderland. Some parents prefer to stay away from a commercial character and allow their children to use their own imagination. You can find toddler girls bedding with unbranded fairies, princesses and mermaids. Also, think about what your child loves – ladybugs, horses, cats, dogs, flowers, butterflies. You can find bedding with all of these themes. Maybe your daughter loves the outdoors. How about garden-themed bedding? A forest full of animals? An ocean with sea life? An active girl may love a dance theme. Consider a tulle bed skirt. A zebra or leopard pattern can bring out her wild side. Add a mix of pillows or stuffed animals for play and snuggles. A tea party is always lots of fun. Look for tea party bedding and pick up a few plastic or porcelain tea sets. The fun is just beginning. Don't be afraid to experiment. Just check with a store's return policy. Sometime you have to see it at home to know if it will work. 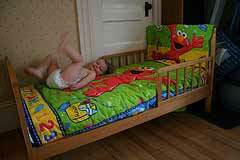 Beyond bedding the other inexpensive decorating to invest in for your child’s room is paint. Nothing sets the mood of the room more than paint. A sunny yellow will have your toddler waking up in a sun-shiny mood. A cool purple will create a relaxing and soothing environment. Hot pink may have her bouncing off the walls. Sea blue will help her float off into dream land. You can create a fun place for your daughter to sleep, play and grow. 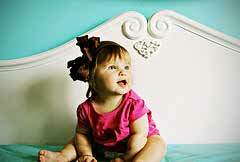 Beginning with the toddler girl bedding as the start, you can make your girl’s room a place to dream.